Tomorrow’s opening ceremony: pomp, circumstance and probably lots of vodka. Tonight’s opening ceremony: buttermilk fried chicken, shrimp tacos and lots of whiskey and vodka. That brings the tally to: Roscoe Village 1, Sochi 0. 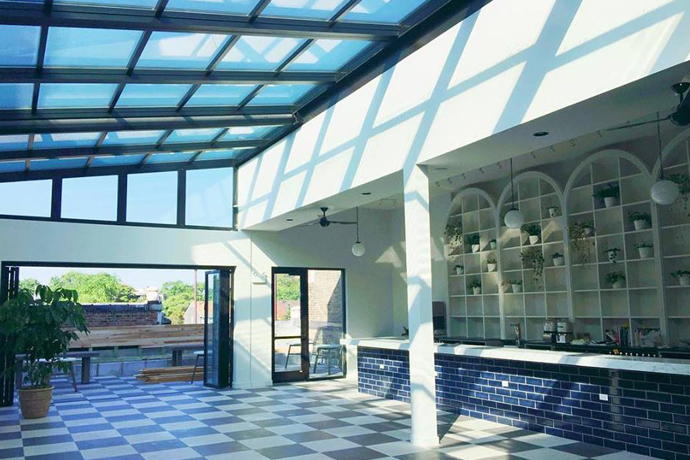 Let the trumpets herald the arrival of Commonwealth, a regal little Roscoe Village sports gastropub, opening today at 4pm. The timing is good if you’re looking for a dignified corner spot to watch the Winter Games—or, you know, look at various historical artifacts. You’ll find an antique US flag, a vintage NCAA sign and framed documents signed by James Madison and James Monroe. Also: a dozen or so flat-screens, if the historical documents don’t have enough hockey fights for you. So watching Sunday afternoon’s Bulls-Lakers game over a pint of Scotch ale—or a glass of scotch—is a perfectly sensible reason to come here. But they’ve also recruited a pair of crackerjack young chefs. They’re not too proud to make you spicy hot wings or a half-pound burger with housemade pickles on a brioche bun. However, they’re also serving charcuterie, they’re sourcing local pork chops, they’re doing artisanal grits with the chicken, and they’re spiking your margarita with sriracha sauce.